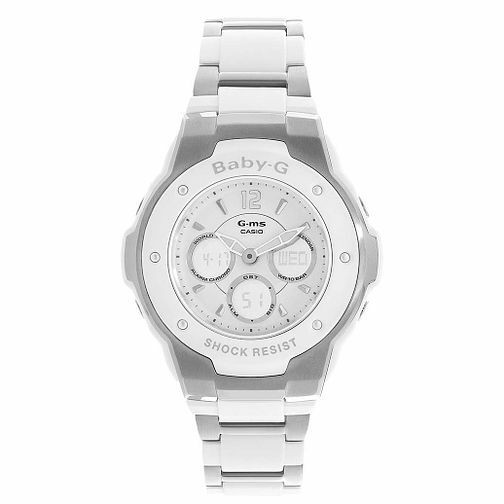 Styled in fresh white resin and stainless steel, this chic ladies' bracelet watch from the Baby-G collection features shock resistance, LED light and world time. Perfect for work or play. Casio Baby-G Ladies' Stainless Steel Bracelet Watch is rated 4.8 out of 5 by 4. Rated 5 out of 5 by Anonymous from Excellent, just what I wanted This was bought as a gift for someone who has had the plastic G shock watches in the past. She loved it. Still sporty, but can be used on more 'classy' occasions too. Rated 5 out of 5 by Anonymous from Lovely looking watch. Bought for my wife who wanted a stylish robust watch that she could wear socially and at work. Looks great very easy to set up and adjust strap. Good solid watch that should last for many years to come.